Spread chocolate chips in the bottom of a glass baking dish. Arrange marshmallows on top. Bake in the preheated oven until chocolate softens and marshmallows are golden brown, 5 to 10 minutes. Let dip cool, about 5 minutes. Serve graham crackers alongside the dip. 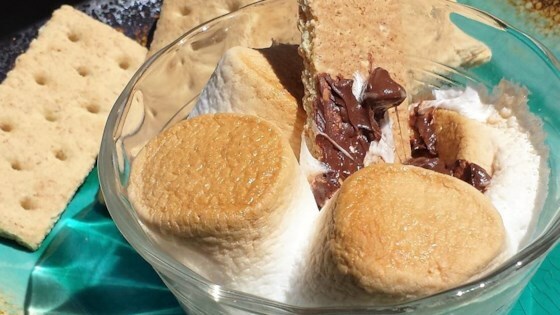 Favorite summer campfire dessert made at home. Genius idea to have s'mores without the campfire! Definitely user error. I strongly recommend you use milk chocolate chips and NOT semi-sweet. Wonderful s'mores without the mess! I lined the bottom of the pan with Hershey bars instead of chocolate chips. This was so simple to make. I made individual servings in ramekins for my kiddos. They were very impressed with their snack time today. I will definitely make this again! Came out great! You have to dig through the marshmallow a little to get to the chocolate but once you do the mixture is perfect! Yummy! I made this with my grandson after playing in the snow. It's a sweet change from hot chocolate. We will be making this again, I hope soon! Sooooooooo yummy! So quick! Couldn't be easier or better.